Anyone who has used a table saw for any period of time is aware, to some extent at least, of the SawStop table saw and the various legal and patent issues surrounding table saw safety and , in particular, the existence of a fairly new safety mechanism that promises (and in a large way follows through on) a system to provide unheard of safety with respect to the use of an electric saw. If you haven’t, then to catch you up to speed, the SawStop was developed and patented by Steve Gass, a lawyer and “avid woodworker” who came up with an idea to make table saws (or any electric saw for that matter) safer for users who come into accidental contact with the blade during use. Mr. Schiech indicated that if the Commission issued a mandatory rule it would be extremely difficult for the industry to comply because of patent restrictions on sensor technology. Ms. Weller pointed out that the Commission does not mandate design requirements and, if it did anything, the Commission would issue a performance requirement and companies would be free to meet it in any way possible, including using sensors, or with a new guard or any of the other improvements the industry was currently considering. The additional cost to manufacturers to implement this technology is estimated to be between $150-$200 per product, an amount that will be passed on to the consumer. Gass (SawStop) is asking for 8 percent licensing/royalties on the wholesale price of each saw sold, a figure that many manufacturers view as near-extortion and monopoly position. This fee would also be passed on to consumers. “False positives” or “nuisance trips” produce downtime and expenses. False positives can trip on common materials such as moist wood (think freshly delivered pressure treated lumber). Existing Underwriters Laboratories document ANSI/UL 987 includes provisions for maintaining safe distance from saw blades and instructions for proper use. The “court is out” on how a high-impact braking mechanism will affect smaller jobsite table saws. A low percentage of the 30,000 annual (U.S.) table saw injuries are due to contact with the blade – most are from kickback. Between the 8% fee and the additional hardware costs, your typical $400 jobsite saw would potentially rise in cost to around $625. Your entry level table saws would all but disappear. I’m not sure how well that will be received by consumers who can keep themselves safe and don’t need the Consumer Protection Safety Commission to do them any “favors”. The real controversy comes in that legislation like this would set a precedent that would mandate any technology that increases the safety of a dangerous power tool. This would necessarily come about since liability issues would force this reality through insurance rates and potential for lawsuits. The potential for unintended consequences are immense – including manufacturers who may stop making more dangerous products or compromising in other areas (quality) in order to meet the price requirements of incorporating this particular technology. On top of all this, in terms of table saw safety, kickbacks are certainly more dangerous, and cause far more injuries each year, than cutting off fingers. Currently new advances are already being implemented through UL approval guidelines (new for 2010) to incorporate these safeguards. So what brought this back to the forefront? This week, a man who was cut by a miter saw says Robert Bosch Tool Corp. “colluded with its competitors” and lobbied the Consumer Protection Safety Commission to keep “flesh detection and braking technology” from being required on table saws. Um… no doubt. To our knowledge no manufacturer is anxious to pay SawStop an 8% license fee for this technology anytime soon, especially when the manufacturing for the technology alone will increase the average price of a table saw by anywhere from $150-$200 by the time it hits the shelves. The Bosch Tool SawStop lawsuit, however, states that “By agreeing not [to] employ such safer alternatives, defendant and its competitors attempted to assure that those alternatives would not become ‘state of the art,’ thereby attempting to insulate themselves from liability for placing a defective product on the market.” The bringer of the suit is essentially claiming that his permanent and “traumatic injury” could have been prevented if Bosch and its competitors had not rejected and fought against the safety technology. No offense, but I don’t think this is a move by Bosch (or any other tool manufacturer for that matter) to prevent safety devices, but simply a move to prevent the unintended consequences of adding mandatory safety devices that would, in some instances, double the price of entry level power saws. If the technology were not under patent I would be more apt to explore the concept of encouraging manufacturers to push this technology forward – as an OPTION. However, the manufacturing costs, coupled with licensing fees, make this an almost ridiculous prospect. The plaintiff claims that “flesh detection and braking technology” and “user friendly blade guard(s)” have been available for years. The flesh detection technology stops a blade instantly when it is touched by human flesh. By his own admission he knew the technology was available (for table saws) but what he doesn’t admit is that even the originator of the technology (SawStop) failed to ever place it into a miter saw – which was the tool used during the unfortunate accident. If the patent-owner hadn’t come up with a reason, method, or incentive to develop a SawStop-enabled Miter saw, then it is unreasonable to assert that Bosch should have done so. He says the technology could have prevented his 2007 injury from a Bosch miter saw. While technically true. His injury also would also have been prevented by a special medical device which creates a force field around your body and deflects all injuries. 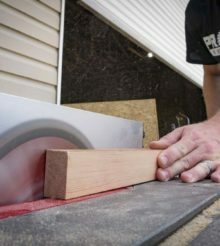 We’re being facetious, but like the force field, the SawStop hadn’t been specifically implemented for use with miter saws… Neither product (force field, or SawStop-enabled miter saw) technically exists. Besides that, his injury would also have been prevented by properly following existing safety procedures that are well documented and clearly were violated in this instance. You can’t cut off your fingers if they don’t get near the blade. He claims that the inventor of the flesh detection brake offered Bosch a licensing agreement in 2000 during a Power Tool Institute meeting, but Bosch rejected the offer. He furthers that Bosch Tool “colluded with its competitors” to develop their own version, and continued to sell their dangerous table and miter saws. I don’t know about the legal mumbo jumbo involved, but that sounds a lot like competition and a business decision to me. To hold Bosch liable for not making a bad business decision that wold cost them lots of money seems a bit unreasonable if not ludicrous. Of course they did, along with every other manufacturer. So Bosch apparently doesn’t want to be under a law that would double the price of many of their saws, require expensive safety devices on miter saws (which really don’t need them) and force them (and all other manufacturers) to pay royalties to a monopolistic single license holder of the SawStop technology… I wouldn’t either. The plaintiff is demanding more than $30,000 from Bosch for negligence, breach of warranty and product liability. We’re sorry for his loss, however we think the judgment should be for him to take a miter saw safety class and pay for all legal costs associated with Bosch having to attend this most frivolous lawsuit. And if he ever buys a table saw from anyone other than SawStop – he should be thrown in jail immediately – to protect him from endangering his own life.